As a teenager, Ricky Delossantos and his friends used to ride around the city with a few pairs of boxing gloves in the trunk, not because Delossantos was a budding amateur star, but because every so often they’d find themselves in the middle of a heated debate that needed to be settled the old-fashioned way. “We’d be in the car arguing and I’d say, ‘We’ve got the gloves in the trunk!’ so we’d go outside, stop in a parking lot and throw hands,” Delossantos said. While it should come as no surprise that the 28-year-old Pawtucket, R.I., native is one of New England’s rising prospects in the featherweight division, boasting a perfect 4-0 record following his first career knockout in February, Delossantos’ promising pro career almost never got off the ground. Delossantos (4-0, 1 KO) started late by most standards, debuting as an amateur in his mid 20s and fighting only 13 times due to a reoccurring thumb injury before turning pro in April of 2017 at the age of 27. Though time isn’t on his side, Delossantos is making up for his lack of amateur experience with a fast start in the pros. 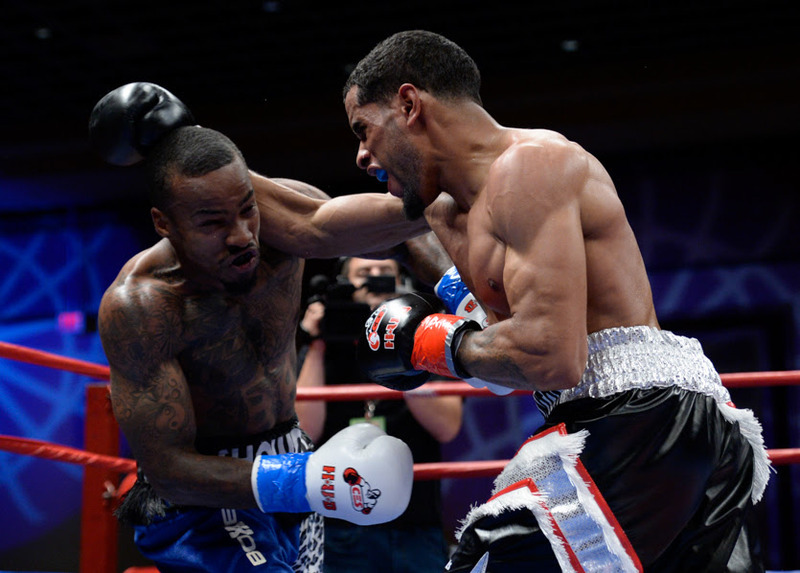 On Friday, May 11th, 2018, he returns to Twin River Casino for the fifth time in 11 months when he faces Maryland’s James Early (3-2) in a four-round featherweight bout on the undercard of CES Boxing’s second show of the year. “I just want to keep pushing and see where this takes me,” Delossantos said. A two-sport athlete at Tolman High School who exceled in baseball and basketball, Delossantos never shied away from the occasional fist fight, but was otherwise a solid student. He went on to New England Tech, where he earned an associate degree as an electrician. He’s always had career options, as he puts it, but soon found himself enamored with the sport of boxing through a chance encounter with fellow fighter Vladine Biosse of Providence. Delossantos was working at a mechanic’s shop where Biosse used to frequent to get work done on his car. He attended several of Biosse’s fights at Twin River and became intrigued with the idea of trying it out for himself, inspired in part by Biosse’s tremendous work ethic. But Delossantos wasn’t joking. Aside from his impromptu parking-lot brawls with friends, he had also taken karate as a youth and briefly trained at a local gym before school and other commitments forced him to step aside. Now in his mid-20s, he knew if he was going to pursue a pro career he would have to make a major push immediately, so he linked up with Biosse’s then trainer, Orlondo Valles. The two have been inseparable ever since, and Delossantos credits Valles as the one who made him genuinely believe he had a chance to succeed in boxing. Delossantos’ short-lived amateur career included a regional Golden Gloves championship in which he fought the entire tournament with a broken thumb, the same nagging injury that forced him to make the difficult decision to turn pro with a limited background. Delossantos debuted last April with a hard-fought win over Worcester’s Philip Davis, who was also fighting professionally for the first time, and hasn’t stopped since. In his most recent fight, he looked as sharp as ever, stopping New Bedford’s Efren Nunez at the 2:23 mark of the third round, capping a dominant performance from start to finish. With each fight, Delossantos a looks a little more seasoned, a bit more refined from his previous bout, while his workload in training camp continues to increase. He runs every day, does his strength and conditioning three times a week and spars between eight and 10 rounds in preparation for each fight. Likewise, he’s been able to train full-time thanks to assistance from his sponsors, among them American Muscle Corps. This is longer a hobby. It’s now his way of life. His opponent next Friday is also coming off his best win to date, a majority decision victory over previously-unbeaten Florida native Joshua Draughter last month in Sarasota. If he wasn’t boxing, Delossantos would probably be selling cars at his cousin’s dealership, working for his father’s taxi service or perhaps putting his degree to use as an electrician. Boxing isn’t his only avenue to success, but it’s the preferred path for a promising, undefeated prospect looking to join the conversation as one of the region’s elite talents in 2018. Johnston, R.I. super lightweight Nicky DeQuattro (3-0, 1 KO) returns to Twin River to face Andy Aiello (0-1) of Bridgewater, Mass., in a four-round bout while cruiserweights Jake Paradise (0-1) of Worcester and Leandro Silva (0-1) of Sao Paolo, Brazil each search for their first career win when they face one another in a four-round preliminary bout. Derrick Whitley (3-0) of Springfield, Mass., makes his Rhode Island debut in a separate four-round welterweight bout. Visit www.cesboxing.com, www.twitter.com/cesboxing or www.facebook.com/cesboxingfor more information, or follow CES Boxing on Instagram at @CESBOXING.